The Toronto Maple Leafs picked up their fifth win in their last six games with a fantastic road performance in San Jose on Thursday night/Friday morning, moving them to 8-1-0 away from home this season. 1. This was a chippier game than we were anticipating going in, with the Sharks clearly having Nazem Kadri’s number still at the forefront of their minds from the Joe Thornton fight last January. The positive development, beyond the two points earned, is that it’s the second high-end veteran team that decided pushing the Leafs around was going to be part of the strategy going into the night early on this season, and the Leafs won both games — vs. Winnipeg in the Toronto rematch a few weeks ago and against the Sharks here tonight. It’s clearly not the Leafs’ bread and butter to engage — Kadri was alone without much help in the scrums and the Sharks were buzzing Frederik Andersen a lot, with Evander Kane going way out of his way to take a dig well after the whistle at one point without much consequence — but at least they aren’t totally intimidated by it and are clearly confident in their own identity and ability to outskate any team in the league while taking advantage of the power plays it creates. 2. 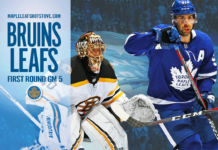 There will be skepticism about this team’s ability to win enough of these kinds of games over a long playoff series until the Leafs prove they can, ultimately. 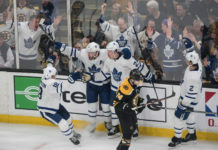 I didn’t think Boston intimidated the Leafs into submission last Spring, but the Leafs got handily out possessed over the course of the series because the game tightened up — as it always does in the postseason — and they didn’t win enough of the physical battles. That will be the test this team will need to pass at the end of the day — it’s less about the targeting of their players and the attempts to goad them into fights, and more about possessing the puck enough in heavier, nastier playoff hockey once the whistles go away. 3. In that latter area (possessing the puck), the Leafs were also good tonight. When the Sharks forecheck gets home, it will cause any team problems, and we saw that at times in the game. By and large, though, the Leafs executed quickly on their d-zone puck retrievals, were organized coming out of their own end, and exited the zone quickly enough that the Sharks couldn’t get on top of them fully or in a sustained enough manner. This game was largely played at the Leafs’ pace and it takes away any size or ‘heaviness’ advantage when the Leafs are playing that fast. That meant the Leafs controlled 52% of the possession in the first period and an impressive 62% in the middle frame with the long change. It goes without saying that if the Leafs are winning the territorial battle, with their capabilities offensively, they are going to come out on the right side of a large majority of those games. There were lots of good o-zone cycle shifts tonight and the Leafs won over 60% of their faceoffs as well. The Sharks didn’t look like a particularly dialed-in team to me at the moment (probably explaining why they have won just 10 of 20 games) as far as how they were tracking back through the neutral zone and how organized they were in the defensive zone. They didn’t take care of the puck well, either, and the Leafs opened up a lot of odd-man opportunities for themselves. Overall, I thought the Leafs handily outworked the Sharks in this game. 4. One way a quick team like the Leafs can help take the sting out of a forecheck like the Sharks’ is by using their skating legs to hold up forecheckers and simply get in the way to buy time. It doesn’t require size to do — it’s just a matter of being engaged with your attention to detail and willingness to keep your legs moving. With the speed of the game today, every fraction of a second is critical; it’s the difference between a forechecker getting only a stick in the lane on the outlet or D-to-D pass, and the first forechecker landing contact that pins up a defenseman and allows the forechecking team to arrive with numbers. Babcock’s teams are known for these kinds of plays — it’s part of the reason his teams have historically been near or at the top of the league in interference penalties as the trade-off — as it’s a real point of emphasis for him both with the forwards tracking back as well as the defensemen buying time for their partners. Usually, you can get away with it if you’re clever, provided you’re turning and facing the same way as the oncoming player. Naz is a bull, man. He’s insane. He is a strong dude. I give him a lot of respect. He takes a lot of stuff every single night. We always give it to him about that slot and how easy it is to score goals [on the power play], but he gets whacked a lot. He is a special player on this team and means a lot to everyone on this team. He is a warrior. He handles himself well in those situations. It kind of brings his game up. He kind of thrives on it. He doesn’t shy away from it. He was actually getting up for it. I’ve said it before, but Kadri is the heartbeat of the lineup. The clear common thread in the Leafs ability to get results without Matthews when he’s been out the past two seasons has been Kadri’s ability to step up for this team. 6. Not sure I’ve seen Frederik Andersen look this economical, confident, calm, and composed in the crease — add any other adjectives that suit you here — as a Leaf. And he’s had some really good periods of hockey since arriving in Toronto. There was a small play highlighted on the broadcast that was a good example of the shape Andersen’s game is in right now. He was down in the butterfly with a second opportunity developing in front of him and he went into statue mode, anticipating that the shooter was going to be on his backhand with little ability to maneuver. He just stuck to his angle and stayed completely still until the shooter shot the puck into him, at which point he held on for a whistle. He’s reading the ice 2-3 plays in advance and it all looks incredibly easy for him at the moment. Not to mention the primary assist tonight on the insurance goal by Marner, which was quite the heads-up play by Andersen (much more than just dumping it off to a guy who went end-to-end). 7. Couple of things on the Kasperi Kapanen 2-1 goal: First, Travis Dermott’s play created it by gapping up so well at the defensive blue line and closing with a slick one-handed poke that stripped the puck clean and sent it forward into Marleau’s path. He’s effective at reaching in and stripping pucks loose that way — he did the same thing in the neutral zone to dispossess the puck and drew a penalty on the play in the second period. 8. Second, watch how fast Kapanen covers the ice coming off the bench. It’s three strides and it’s over. Logan Couture is on his bike on the play and stands no chance of beating him to the spot. Kapanen’s confidence when he gets an opening is really high at the moment — and that’s really something because he creates a lot of them for himself with those rocket launchers for wheels. William Nylander’s absence has been a dark cloud hanging over one of most highly anticipated Leafs seasons in decades, but the silver lining is always the window of opportunity it creates for others in the lineup. Kapanen’s ability to grab it with both hands and show he’s a legitimate top-six winger in this league has been a major revelation. He’s another weapon — and a highly-valuable, unique one at that — for the opposition to account for on a Leafs team that is chocked full of them, and it’s likely he wouldn’t be going along nearly as well if not for the opportunity Nylander’s absence has created. 9. The Leafs’ depth lines continue to make inroads as far as their overall contribution from a possession and secondary scoring standpoint. When the fourth line can give you the calibre of shifts it had up against the Sharks’ top lines a few times in this game, it’s huge for the team’s ability to roll lines on the road and the coach’s confidence/trust in that unit. Nice for Gauthier to get the monkey off his back with his first point of the year, also (the floodgates will surely open now for the Goat). It’s obvious Andreas Johnsson has his mojo back as far as his willingness to work and compete. Of late, Tyler Ennis has been more effective than I thought he’d be on in a fourth-line situation in terms of his ability to bring some pace and puck-carrying ability to the line through the neutral zone in addition to his willingness to battle. Both of those units look to have found their identity of late. 10. When you take Andersen’s play in combination with the team’s dialed-in special teams, its improving depth contributions from its third and fourth lines, its much-improved starts to games, its improving numbers at 5v5 as far as the possession game, and the way it’s closing out games with the lead, this club is really piecing together an excellent stretch of hockey here without Auston Matthews and William Nylander in the lineup. And that’s the most tantalizing part about this — the Leafs are getting contributions from all areas of their lineup and we’ve not even seen this group at full strength yet. The Leafs are scoring at 3.58 goals per game (2nd in the NHL) and have zero points from Nylander and have been missing Matthews for seven out of 18 games.